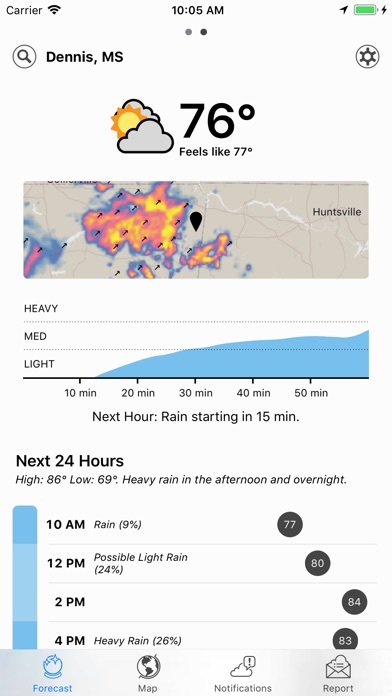 Dark Sky is the most accurate source of hyperlocal weather information. With down-to-the-minute forecasts, you’ll know exactly when the rain will start or stop, right where you’re standing. (It’s like magic.) Featured in: New York Times, Wall Street Journal, Fast Company, Wired, and more. YOUR WEATHER, DOWN TO THE MINUTE Dark Sky is able to create forecasts for your precise location, giving you minute-by-minute predictions for the next hour and hour-by-hour forecasts for the next day and week. 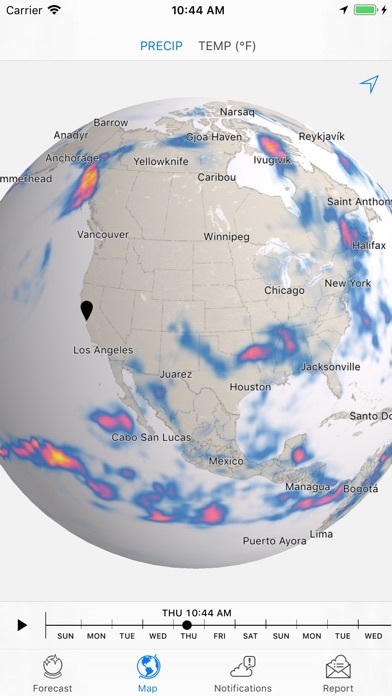 BEAUTIFUL WEATHER ANIMATIONS The same technology that powers Dark Sky’s predictions also allows us to make the world’s first perfectly smooth radar animation. 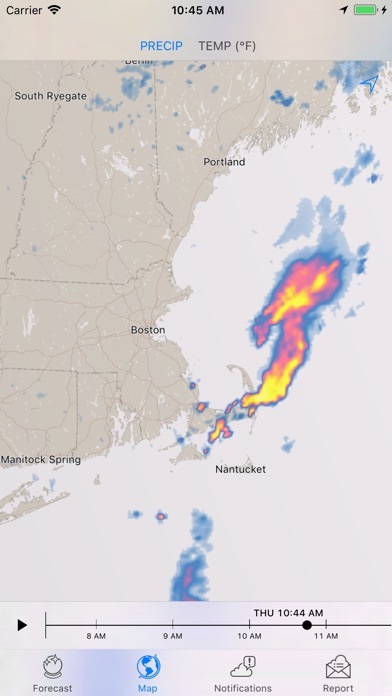 Other apps show you a chunky slideshow that makes it nearly impossible to tell how storms are moving. But Dark Sky’s radar animation lets you see the actual path of the storm: how it moved in the past, and where it’s going in the future. 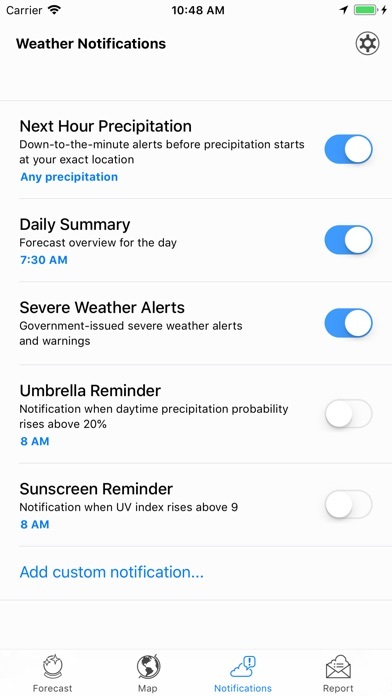 PUSH NOTIFICATIONS Dark Sky comes with advanced notification options: Receive down-to-the-minute alerts before it starts raining at your exact location, get notified of government severe weather alerts (for such things as thunderstorms, flooding, hurricanes, etc. ), or even create your own custom notifications covering the next 24 hours for things like temperature, wind, precipitation and more. Even if you haven’t opened the app in days, Dark Sky will tell you what you need to know, when you need to know it. TODAY WIDGET The Dark Sky Notification Center Widget tells you at a glance what’s going to happen in the next hour and the next week, so you don’t even have to unlock your phone to quickly check the weather before heading out. TIME MACHINE Explore weather in the past or future. Choose a date and see historical weather data or future predictions based off of seasonal averages. APPLE WATCH Dark Sky looks great on your wrist. 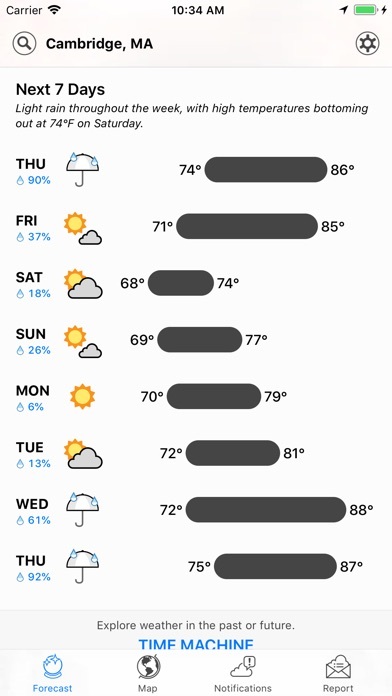 Get notifications and check out the weather for the next week with the Dark Sky app built from scratch for Apple Watch. I have wanted a simple weather app that not only is easy to read but actually loads quickly every time. I’ve used this app for a couple days and I’m impressed with how it looks and works. Easy to interpret the forecast that day, but also easy access to more detailed hourly info if that’s what you need. I also like that the extra info such as humidity, sunset and other stuff is a simple tap on the temp. 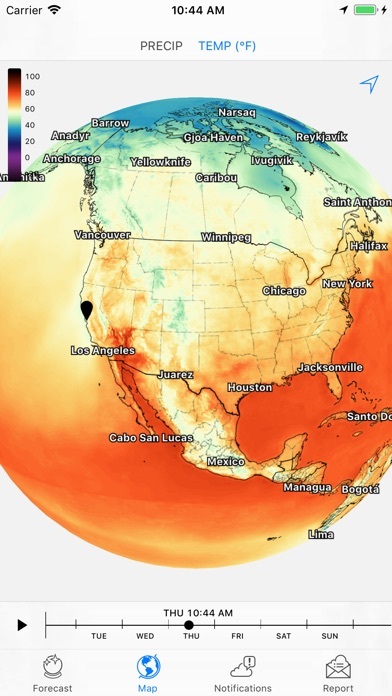 The entire main screen doesn’t have to be filled with every piece of weather data available. Most of us don’t need to know the barometric pressure every day, but it’s lurking nearby if we do. Good job folks. For the rest of us, this is well worth the money. Truly a “you get what you pay for” situation. Please incorporate this word into your forecasts. The overall idea of predicting the weather and being accurate is great! Two issues: 1) emergency weather alerts do not work even though enabled. 2) Don’t give me the time machine feature if you’re just going to give me today’s forecast for the next 10 coming years then 0 for the rest of eternity. I think common sense tells us none of this is right but still don’t bother. This is a well designed app with some pretty good features. Unfortunately the forecasts have been off. Today, for example, it forecasted a high of 64 degrees and it was off by 10 degrees leaving me way underdressed. This isn’t the first time either, unfortunately. I downloaded this app after I read a review I read that praised the Apple Watch part of the app. The info displayed on my watch has good information but the temperature doesn’t update very often. Sometimes I have to open the app on my phone then also open it on my watch to force an update. I contacted the developer, no response. Maybe the paid version is better, but maybe not. I’m not going to spend money on an app that doesn’t work properly. Especially with no customer service! Can't look even two weeks into the future? What's the point of this if it doesn't show me data even two weeks out. What a waste of money!!!! I never pay for apps but I had a $5 gift card and decided to try the editors choice for a weather app. I hate it. 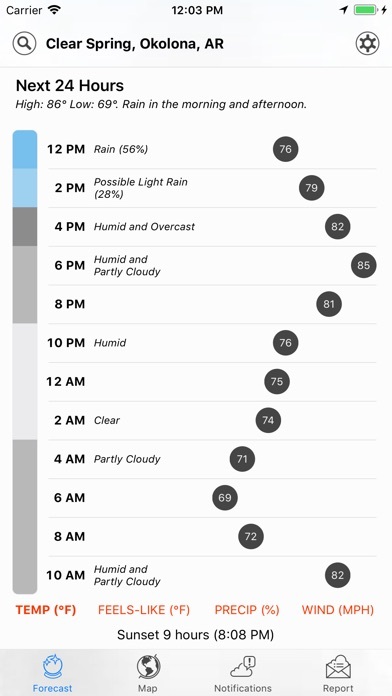 The user interface is well designed but the hyper local forecast is a joke. Just a gimmick as far as I'm concerned. The radar is literally the worst I've ever used. The map provides no detail and the colors look like oily fingerprints on glass. I am so disappointed. Since this app cost money and getting on the website is free, I expected yo get the same information. No wind information at all. Would line to know speed and direction. Missing all the details! Please fix.